Surrounded by 14ers and perched at 10,200 feet, Leadville, Colorado stakes its claim as the highest incorporated city in the United States. 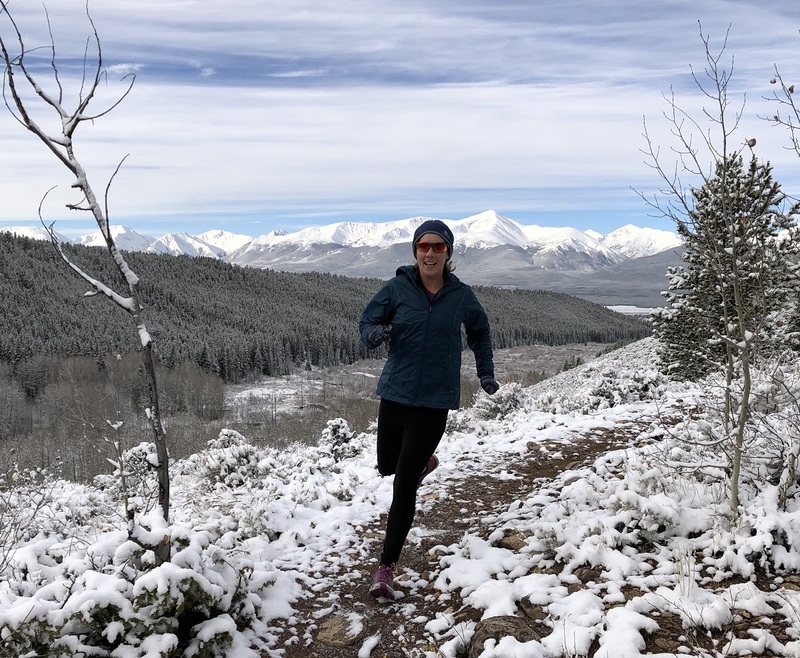 Renowned for the Leadville Race Series, ultra runners, mountain bikers, and hikers flock to Leadville in the short but sweet summers. With an average of 120 inches of snow per year, fat biking, ski joring, and snowshoeing take over in winter. We visited Leadville in early October, during shoulder season. 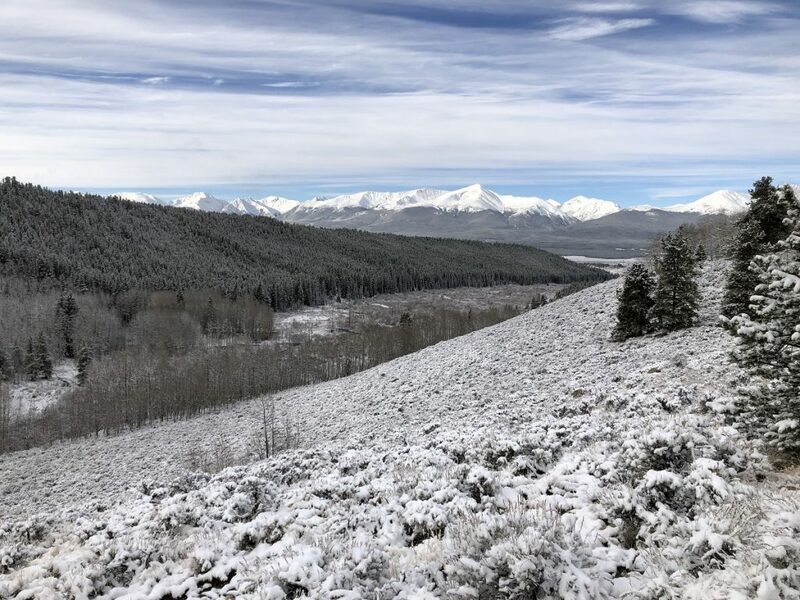 Only a few stands of late changing golden aspens remained, and we quickly discovered that Jack Frost arrives early in the mountains. Our first morning, we awoke to several inches of snow, and our daughters wasted no time building a snowman. Winter weather meant we’d have to tackle the looming 14ers another time. We weren’t equipped for hiking in deep snow, and we didn’t want to push our limits at altitude. Instead, we took advantage of incredible trail running just minutes from Main Street. My mom traveled with us and generously watched our girls every day so my husband and I could hit the trails together. We didn’t want to abuse this privilege, so we needed trails that provided the most bang for our buck. 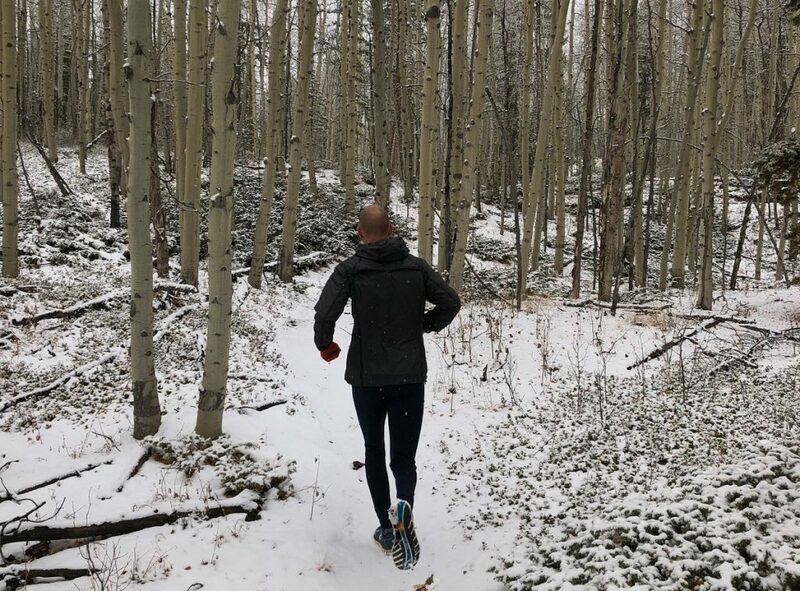 Easily accessible from Leadville, with out-and-back and loop options, these trails were perfect for 45-60 minutes of lung-searing effort. 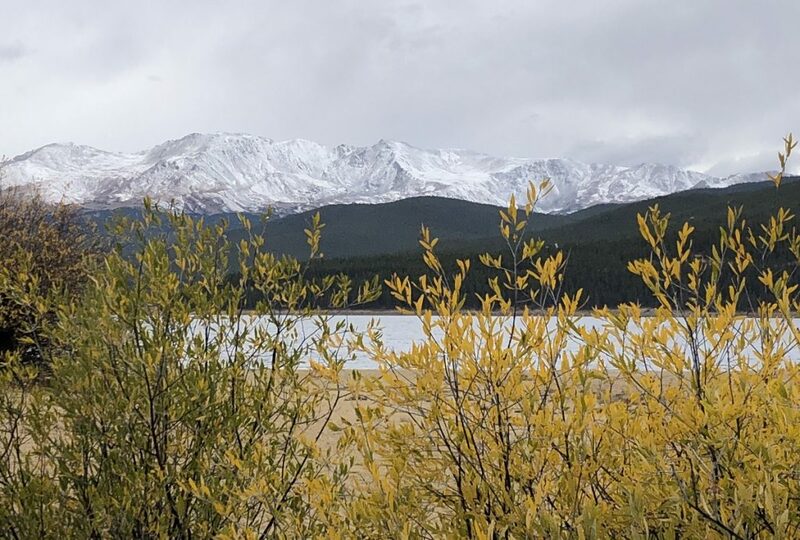 Sitting in the forest just west of Leadville, Turquoise Lake is a popular spot for fishing, camping and hiking. Part of the Leadville Trail 100 Run, the Turquoise Lake Trail rambles gently along the lakeshore. Don’t let the gentle profile fool you. The trail sits just below 10,000 feet, and the elevation alone is enough to set your legs and lungs on fire. When you stop to catch your breath, don’t forget to look up. On a clear day, the trail provides stunning views of 14,036-foot Mt. Sherman and the Mt. Massive wilderness. 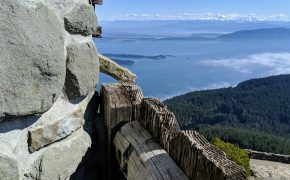 Turquoise Lake Trail follows the shoreline for six miles to the May Queen Campground for a 12-mile out-and-back. We were still acclimatizing to the high altitude, so we only ran about 2.5 miles before turning around. As we finished, the first snowflakes started to fall, and the clear views of the surrounding 14ers vanished into the clouds. Directions: From Leadville, follow County Road 4 (Turquoise Lake Road) to trail head parking at the dam. After running Turquoise Lake Trail, we drove around the lake and saw signs for the Timberline Lake trail head. We decided to look it up later, hoping it would be a family-friendly hike. 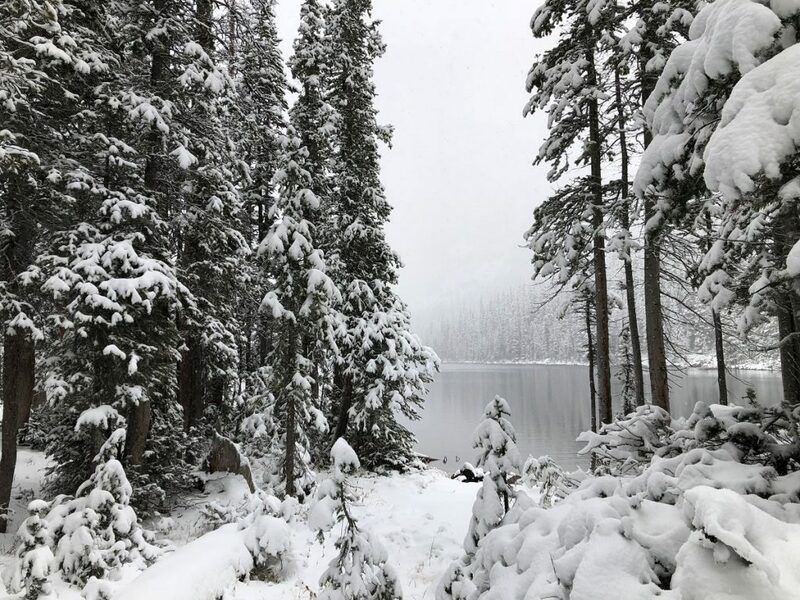 With only 500 feet of elevation gain over 2.2 miles (one-way), this short but sweet trail pays off big, terminating at beautiful Timberline Lake. 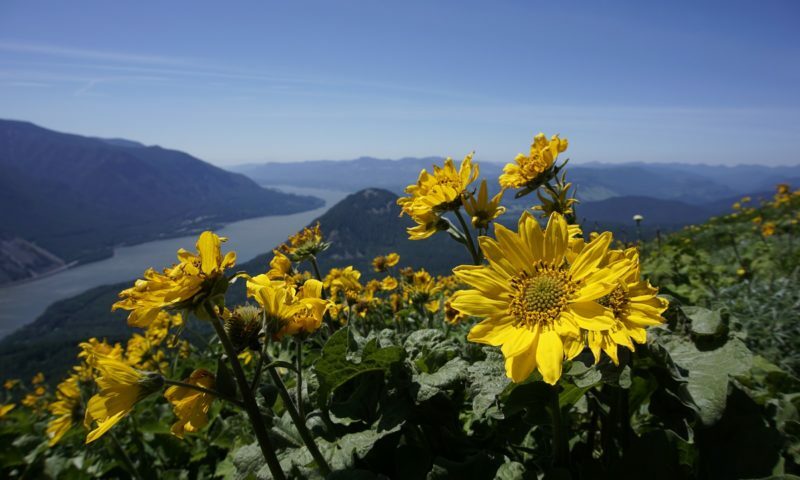 It’s perfect for families and young hikers and would make a challenging trail run or snowshoe trek in winter. Timberline Lake Trail. Pictured in KÜHL SKULL CAP and GIRLS SPLASH ROLL-UP PANT. We drove to the trail head the next morning and hiked as the snow piled up. We followed the Colorado Trail for a short distance before the Timberline Trail split and entered the Holy Cross Wilderness. The trail gradually climbed through beautiful pine forest, and the entire landscape was blanketed in freshly fallen snow. When we reached the lake, we couldn’t see the surrounding mountains, but the quiet hush and silver light created an unforgettable scene. Directions: From Leadville, follow County Road 4 (Turquoise Lake Road). Cross the dam and continue to the western end of Turquoise Lake, just northwest of the May Queen Campground. Built and maintained by Leadville’s Cloud City Wheelers cycling club, the Timberline Trail System is a treasure trove of single track with stunning views of the surrounding 14ers. Easily accessible from the Colorado Mountain College campus or the paved Mineral Belt Trail, the Timberline Trail System is only minutes from Main Street. Miles of quiet, well-maintained trails criss-cross old growth pine forests and aspen stands, descending all the way to the river. The Timberline Trail System is multi-use, so don’t be surprised to see hikers (often with four-legged companions), runners, and cyclists. In the winter, fat bikes and snow shoes dominate the scene. Yet, we had the trails to ourselves in early October. Running through aspen stand on Timberline Trail System. Pictured in KÜHL PARAJAX JACKET. We ran the Timberline Trail System three days in a row and had enough options to cover different terrain each time. The ultralight KÜHL PARAJAX JACKET was the perfect outer layer to keep us dry as the snow fell. Twice we ran through pretty heavy snow showers, but on one run, the sun broke through the clouds. Wispy clouds and bright blue sky provided the backdrop to the stunning peaks in the distance. Post-Run Treat: Needing to warm up after an afternoon run through the snow, we stopped by City on the Hill Coffee and Espresso for hot drinks. Pastries made in the morning are sold as ‘day old’ for $1 in late afternoon, so we picked up a delicious muffin, too. 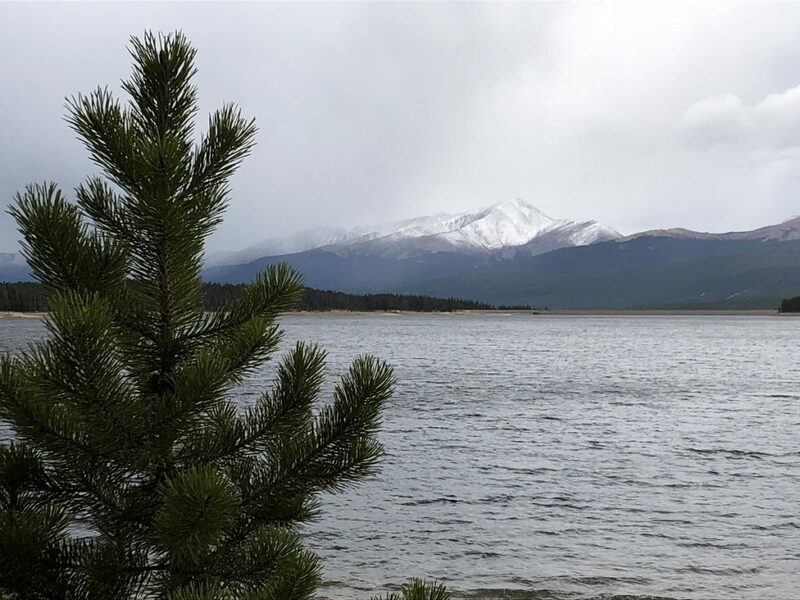 Less than 45 minutes from Leadville, Buena Vista makes a great day trip. During the summer months, Buena Vista is bustling with rafters and paddlers, but we had Main Street to ourselves on a beautiful fall day. The bouldering park is great for kids, and the locally owned Book Nook is perfect for picking up a new or gently used book. At a lower elevation than Leadville, the colors along the river were stunning. A well-maintained trail system is worth exploring on wheels or by foot. We’d already gotten our run in for the day, so we just enjoyed the gorgeous scenery. 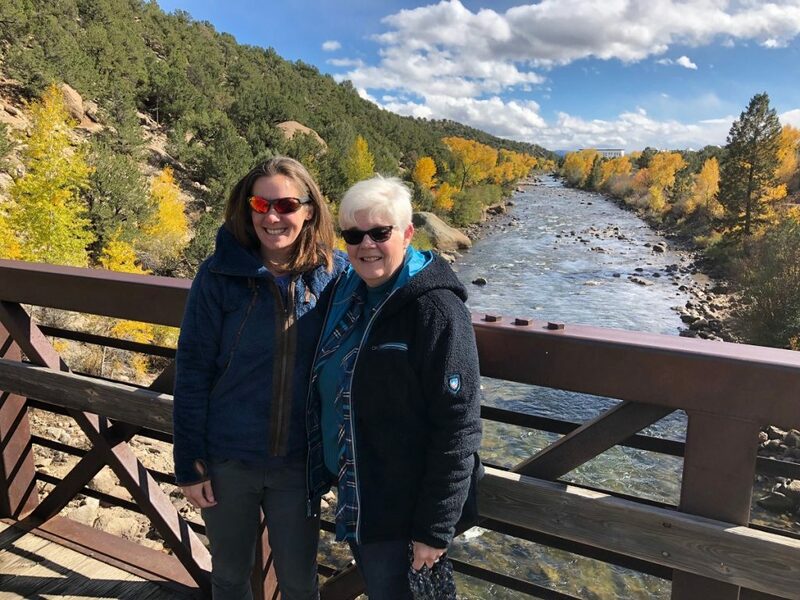 Nicole and her mom soak in the scenery in Buena Vista, Colorado. Nicole pictured in KÜHL FLIGHT JACKET and INSPIRATR ANKLE ZIP. 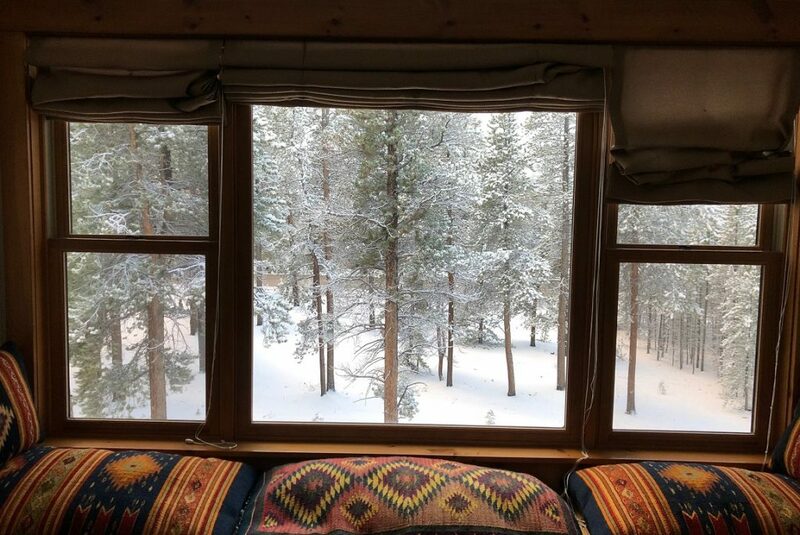 Special thanks to KÜHL cyclist Jill Cederholm for opening her beautiful Leadville home to us! 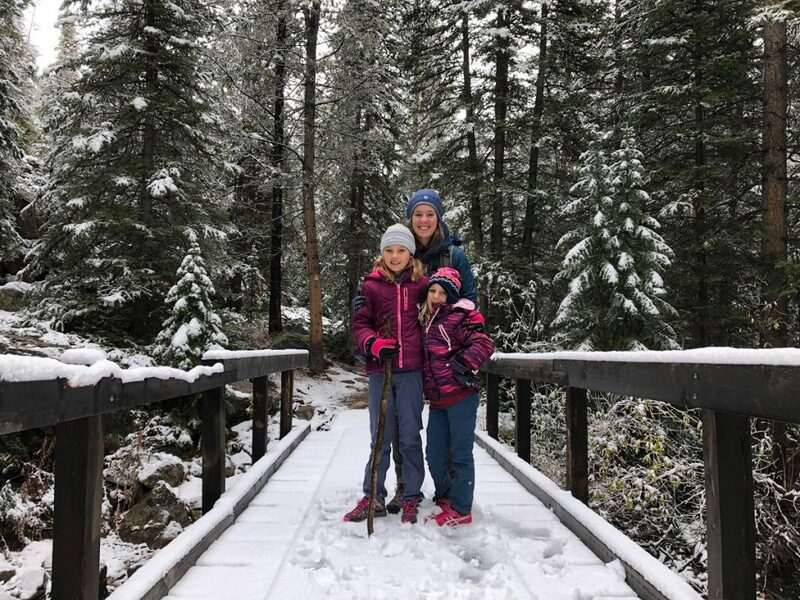 Nicole’s idea of a perfect vacation involves hiking, trail running and SUP with her husband and two daughters. 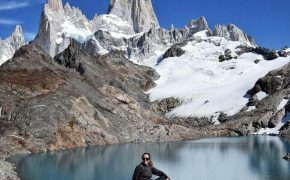 She writes about travel, raising KÜHL kids and her obsession with outdoor apparel for KÜHL.